12V DC LED Lamps Lights and Lighting comes of Age! 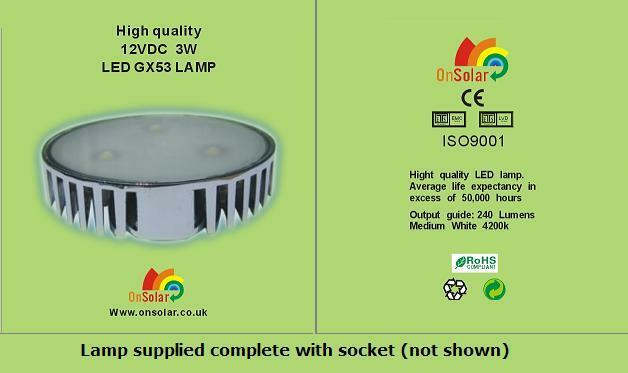 I am happy to report that we at OnSolar.co.uk have been quietly testing 12V DC LED lighting options for the past 7 or 8 years. Until recently, we were basically fairly unimpressed I have to say! However, the landscape has started to change and things are certainly getting very interesting. We now have several types of LED high power single chip / multi chip lamp options available which are very potent indeed. One of the things we have tried to do whilst attempting to provide products for our discerning market, was to bring products which actually provided a full solution to a particular low voltage lighting quandary, not just a stop gap or ‘that will do’ scenario. We now have several items which have been rigorously tested and which we use ourselves in homes, workshop and processing depts to great effect. The quality of these little units at just 3 inches wide is hard to portray here but suffice to say, they are made to a high standard and are in fact quite heavy what with the extraordinary large cooling fins built into the back of the unit. The lamp unit has a lovely dark chrome finish as standard. The lamp is supplied complete with socket and cable ready to connect to your project. A nice quality Chromium coloured socket is available as an upgrade if desired.